The other man was skeptical and thought it might be a commercial aircraft and snatched the binoculars for a look. 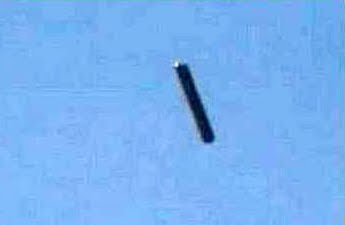 What the two young men observed a rare cylinder UFO that eventually turned some 30 degrees to the right and disappeared in the haze. Six days later on 8 June 2000, a Staten Island, NY resident witnessed a huge cylinder UFO with an estimated 400 lights on it. He tells us that an additional half dozen neighbors saw the craft as well as a couple of police officers. 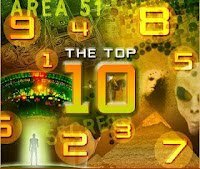 A study of National UFO Reporting Center (NUFORC) and Mutual UFO Network (MUFON) data suggests that Cylinder UFO sightings were really quite rare until relatively recently. Records prior to 1950 report virtually no cylinder UFO sightings. The decades of the 60s, 70s, 80s, and 90s sport sighting levels with an average of about two sightings per decade. Around the year 2000, sightings began to increase to a little under a dozen per year. Then in 2009, it was if some intergalactic starship dealer threw a gigantic sale because suddenly huge cylinder UFOs began appearing in New York Skies at a rate of about a dozen a year, as evidenced by the following chart. World sightings for cylinder UFOs likewise has been on the rise. 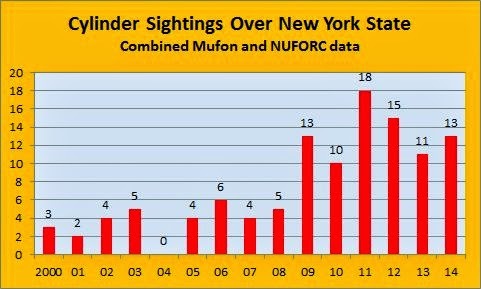 For example, the combined cylinder sightings from both the MUFON and NUFORC for 2014 total about 258 globally; giving New York State about 5% of the world cylinder sightings. I hope to continue my analysis of various classes of UFOs and their relative sighting numbers here New York.